We are starting our monthly blog sponsors again for this year, so a big thank you to Sunnyside 2014 for getting the ball rolling for our September post! After camp I had the fortune of spending a week with my niece and nephews at Maplewood Resort on County D (in between Towering Pines and Woodland). 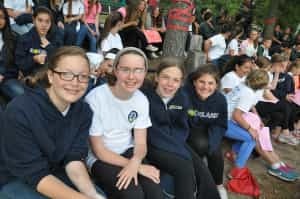 School started for them on the Monday after their return to Nebraska (so basically a week after camp ended), and they are already reporting that the balancing act has begun! Being able to juggle homework, busy after school schedules of sports and other activities, and time for friends is not always easy regardless of being in elementary, middle, or high school. When talking with my sister recently about the prognosis for the 2014-15 school year with her kids, she told me a story that I can’t stop thinking about. Come to find out, my niece was anxious for most of the summer about returning to school this fall because of a new purchase in store for the school cafeteria. At the end of last year, the announcement was made that the 30+ year-old rectangle tables that had become fixtures through the generations (they were the same tables that were there was I was a student!) would be replaced with brand-new round tables. Evidently the long rectangle tables of previous years at least afforded the opportunity for students to appear to be sitting in a large group even if there were smaller groups clustered together within the masses. So, my 7th grade niece decided to brave the very likely possibility of rejection and casually asked her friend of 10 years if it would be OK for her to sit at the volleyball table on occasion. As expected, my niece was met with, “Why would you want to do that? and “I don’t think the other girls would like that very much.” Interesting to note, my nephews faced similar scenarios within their own grade levels (6th-11th), so age and gender didn’t really matter in this instance. So, what are the takeaways from this all-too-familiar scene in school cafeterias around the globe? 1) At Woodland and Towering Pines, even though we have both round and rectangle tables in our respective dining areas, cabins are assigned to their designated spot for each meal and campers are not left wondering if someone will sit next to them for each meal. 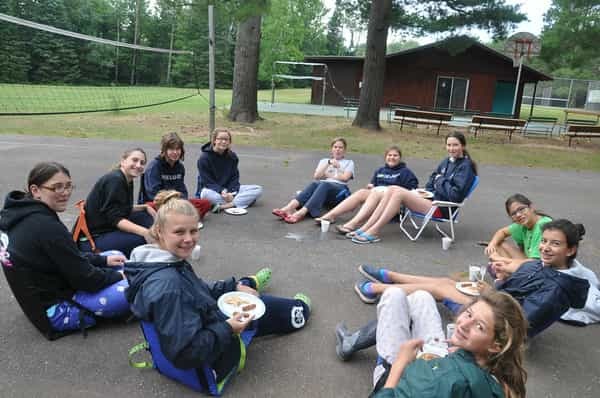 Counselors typically spread out amidst the cabin groups and often encourage campers to rotate seats so that mixing of campers is part of the normal routine at meals. 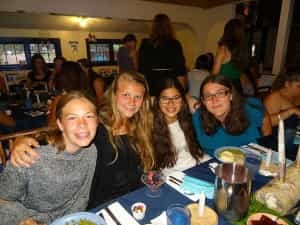 In addition, the counselors facilitate conversation at each table so that all campers are engaged and an integral part of the cabin community. 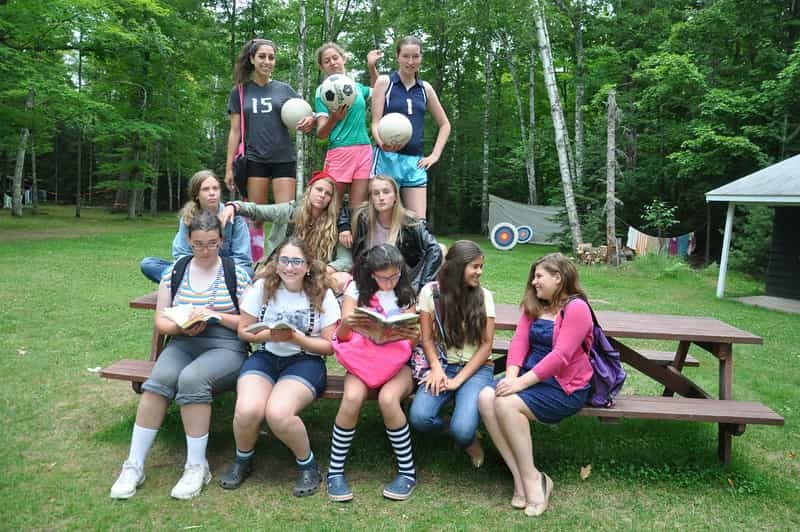 Spending three meals a day together for 6 weeks makes for a lot of togetherness and is great for cabin bonding! 2) The people making the decisions may not always be the ones with the best information. My sister asked my niece if any students were interviewed to see if they wanted round or rectangle tables in the cafeteria, and as you might expect, the people whose opinion mattered most were not consulted. Taking the time to listen to kids is what we do EVERY SINGLE DAY at camp…more often than not, kids have better ideas than most adults could ever begin to conceive! BEST WISHES FOR A GREAT SCHOOL YEAR…we CAN’T WAIT to see you next summer!! !